Wet crawl spaces and basements are the biggest potential home moisture source. The average person emits four pints of water daily into the air through breathing and perspiration. Showers, housecleaning, and cooking can add up to another three pints per person. Moist firewood and house plants generate additional moisture. Water brought into the home on shoes or clothing also adds moisture to the home. Relative humidity measures how saturated with moisture the air is. Relative humidity is 100% when indoor air is completely saturated with moisture. Air at 50% relative humidity could hold twice as much moisture as it currently holds. Unsaturated air can become completely saturated either by absorbing more moisture or by cooling off. When air at 100% relative humidity absorbs more moisture or cools off, droplets begin to form on the coolest objects in the environment. These droplets are called condensation. 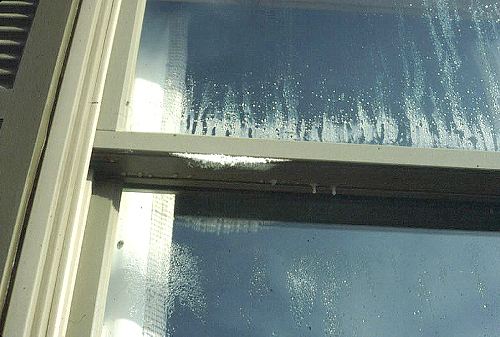 Condensation happens most frequently and plentifully on the coldest surfaces. Experts on cooling say that indoor air should be less than 60% relative humidity for adequate indoor comfort during the summer. During cold weather, indoor relative humidity should be less than 40% to avoid moisture condensation problems. Un-vented gas or kerosene space heaters add unwanted moisture and other more dangerous pollutants to the indoor air. Therefore, they should never be used. Gas ranges and ovens also emit moisture and combustion by-products. Open a window slightly and use your kitchen exhaust fan when cooking with gas. Vent dryers outdoors—not into living spaces, crawl spaces, basements, or attics. And, avoid using humidifiers, unless they are medically prescribed. Residential Energy: Cost Savings and Comfort for Existing Buildings, Saturn Energy Auditor Field Guide, and Your Mobile Home: Energy and Repair Guide for Manufactured Housing contain more information about solving moisture problems.